Schools Matter: Part 3: Has Corporate Education "Reform" Earned Another 25 Years to Complete the Resegregation and Privatization Agendas? 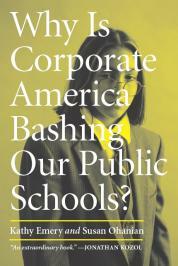 Part 3: Has Corporate Education "Reform" Earned Another 25 Years to Complete the Resegregation and Privatization Agendas? 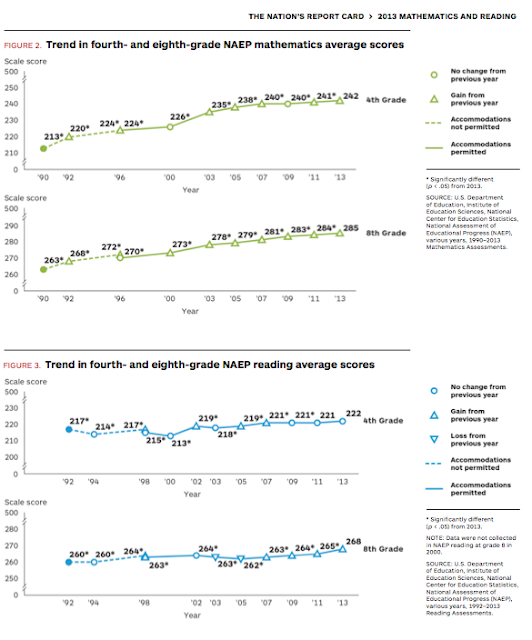 The continued hydroplaning of NAEP scores nationally allows the world to see what the corporate education losers will not admit: the 3rd generation of test based accountability is not working. Rather than moving beyond corporate ed reform's status quo (oxymoron alert), however, Duncan and the shrinking elements of the corporate media that still print the CorpEd news releases point, instead, to the RTTT grant winners where scores rose in math and reading for both 4th and 8th graders: DC and TN. Ignored are the 17 RTTT grant-winning states where they did not (full list here). We might expect a bit more for three and half billion public dollars, but with losing corporate welfare schemes put in place with NCLB's and RTTT, we have to wonder if Duncan did not experience a sigh of relief when scores did not go down. Yet. The state dropped from 45 to 46 in the nation in fourth-grade math; 39 to 41 in fourth-grade reading; 43 to 45 in eighth-grade math; and 34 to 41 in eighth-grade reading. Twenty-six percent of fourth-grade students are proficient in reading, and 30 percent are proficient in math. Twenty-seven percent of eighth-grade students are proficient in reading, and 24 percent are proficient in math. When 2013 scores are compared to 2009, we see, in fact, that Tennessee actually lost ground this year in 4th grade reading (3 points) and 8th grade math (3 points). Easy come, easy go. The big NAEP story this year that no one is paying attention to is the continuing progress made by the Dept. 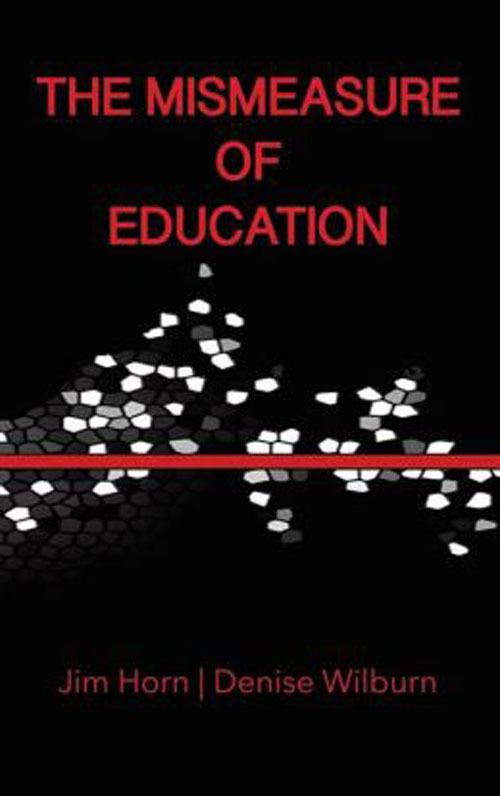 of Defense schools (DOD), where there is no RTTT teacher evaluation system based on test scores, where standardized tests don't dominate the schools, where teachers are respected and provided real professional developement, where resources are plentiful and classes small, and where minorities aren't segregated in corporate charter schools. The DOD school students, in fact, are 40% minority and 50% qualify for free or reduced-price lunch. Note that DOD has higher average scores for both math and reading in 4th and 8th grades. Also note the black-white average score gaps are much lower at DOD schools than either TN or DC (same is true for Hispanic-White achievement gaps, too).
. . . .It has become fashionable for American educators to fly off to Helsinki to investigate how schools there produce such high-achieving Finns. But for just $69.95 a night, they can stay at the Days Inn in Jacksonville, N.C., and investigate how the schools here on the Camp Lejeune Marine base produce such high-achieving Americans — both black and white. They would find that the schools on base are not subject to former President George W. Bush’s signature education program, No Child Left Behind, or to President Obama’s Race to the Top. They would find that standardized tests do not dominate and are not used to rate teachers, principals or schools. They would find Leigh Anne Kapiko, the principal at Tarawa Terrace Elementary, one of seven schools here. At schools here, standardized tests are used as originally intended, to identify a child’s academic weaknesses and assess the effectiveness of the curriculum. Ms. Kapiko has been a principal both inside and outside the gates and believes that military base schools are more nurturing than public schools. “We don’t have to be so regimented, since we’re not worried about a child’s ability to bubble on a test,” she said. Under Mr. Obama’s education agenda, state governments can now dictate to principals how to run their schools. 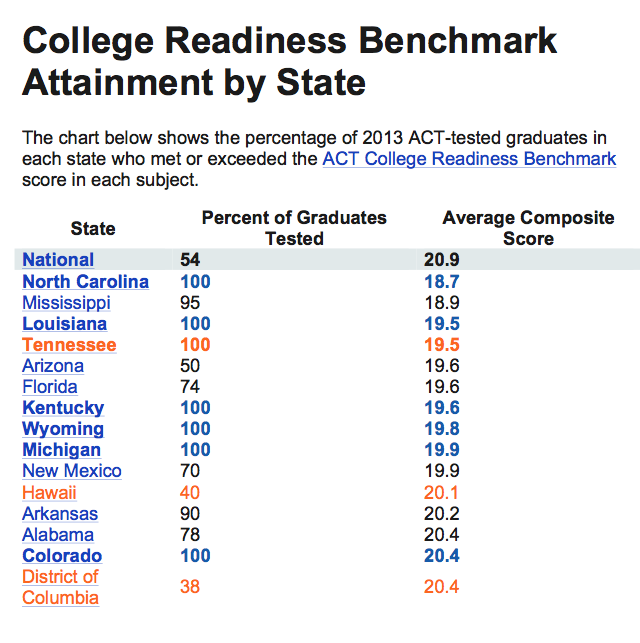 In Tennessee — which is ranked 41st in NAEP scores and has made no significant progress in closing the black-white achievement gap on those tests in 20 years — the state now requires four formal observations a year for all teachers, regardless of whether the principal thinks they are excellent or weak. The state has declared that half of a teacher’s rating must be based on student test scores. Ms. Kapiko, on the other hand, has discretion in how to evaluate her teachers. For the most effective, she does one observation a year. That gives her and her assistant principal time for walk-through visits in every classroom every day. The average class in New York City in kindergarten through the third grade has 24 students. At military base schools, the average is 18, which is almost as good as it is in the private schools where leaders of the education reform movement — Mayor Michael R. Bloomberg of New York; the former education chancellor in New York City, Joel I. Klein; and Bill Gates of Microsoft — have sent their children. A 2001 study on the success of the military base schools by researchers at Vanderbilt University cites the importance of the smooth relations between the teachers’ union and management, and Ms. Fitzgerald said that continued to be true. Helping children succeed academically is about a lot more than what goes on inside the schools. Military parents do not have to worry about securing health care coverage for their children or adequate housing. At least one parent in the family has a job. The military command also puts a priority on education. Bryant Anderson, a petty officer who is stationed at the Naval Surface Warfare Center in Dahlgren, Va., is given time off from work to serve as president of the base’s school board and coach middle school basketball and track teams. Parents with children at the civilian schools where Ms. Kapiko has been the principal have not received that kind of support from their employers. “If Dad works in a factory, he gets three absences and he’s fired,” she said. A family’s economic well-being has considerable impact on how students score on standardized tests, and it is hard to make exact comparisons between military and public school families. But by one indicator, families at military base schools and public schools have similar earnings: the percentage of students who qualify for federally subsidized lunches is virtually identical at both, about 46 percent. What is clear is that the base schools have made impressive progress in narrowing the achievement gap. 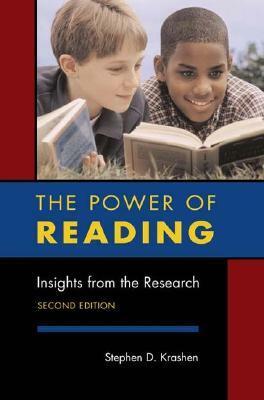 In the last decade, the gap in reading between black and white fourth graders at base schools has decreased to 11 points this year (233 compared with 222), down from a 16-point difference in 2003 (230 compared with 214), a 31 percent reduction. In public schools, there has been a much smaller decrease, to a 26-point gap this year (231 compared with 205) from 30 points in 2002 (227 compared with 197), a 13 percent reduction. The military has a far better record of integration than most institutions. Almost all of the 69 base schools are in the South. They were opened in the 1950s and ’60s because the military was racially integrated and did not want the children of black soldiers to attend racially segregated schools off base. . .
Great post, but isn't the DOD black-white gap the BIGGEST at 54? Thank you. Chart now corrected! So much that is factually wrong here. Sorry, but as a DoDDS teacher we do not get any real PD. 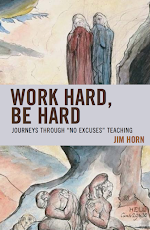 Test scores do drive our culture and our resources are drying up. The last 3 PD's I've gone to I have had to pay out of my own pocket to attend. Also we don't rank schools because if you get stationed overseas you either go to the DoDDS school, or you home school. Where no DoDDS school exists you can usually go to an International School. The Carolinas are a favorite of the military. There are eight military bases in North Carolina. The Navy is the only branch without any bases in NC. For further information you can visit military bases in north Carolina by state.